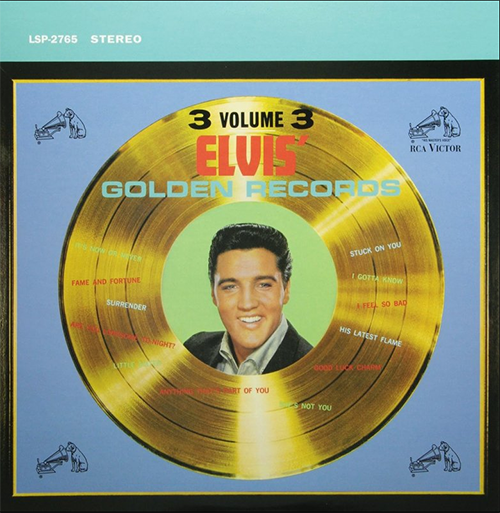 The "Original Artists"-label will release a 2 LP "Elvis Golden Records - Volume 3" as 180g vinyl in only 2500 copies. oh my ! oh my ! where have the years gone . I remember seeing this album in the window of my fav music shop in the 60's . Its a HMV as I look at it in Australia it was RCA black label with Nipper ( Nipper gone to Dogs Heaven and sticking up for Elvis in Bone Alley ) . Ah yes where have the years gone . Good album , top shot of Elvis as the for comments on tech's would not have a clue just listen to the songs . oh my o my. Yep Lex, and this could be (one of ?) the reason(s) why, a long long time ago, many LPs had 10 songs, 5 songs a side. Always El. Audiophiles state that around 15 minutes a side gives the best possible quality. So six songs on a site is (just) too much. Man, I liked, Flaming Star when I wassail about 7,then I saw it in later years sand gotta thinking ' Elvis was pretty stiff, now, Wild in the Country, that's, acting son, Jailhouse Rock king Creole, loving u, Rock 'n' Roll classics, the mid 60's flicks , some of my favourites though, just fun, fun, fun and the soundtracks weren't bad either!! Side c is the killer side, 'his latest flame' a big influence on The Smiths, they even released a live version of it, but the lead singer had it withdrawn, over disputes with his label. Hi circleG. Agreed ! I'm almost sure the difference in sound will not be dramatic. I wonder how much cutted available surface per song they will use. I really wonder why they'll issue in this form !? Always El. very interesting points, something I've been confused about lately. The trouble is there has to be quite a dramatic difference in sound to justify three songs per side. i once again refer to the Beatles latest vinyl issues which are basically as close as you'll ever get to the original thing, same amount of tracks per side and amazing sound quality. Pietro S, you're welcome ! Your reaction was normal, asking yourself why 3 songs each side, and 4 sides makes a total of 12 songs , just the total number of songs on the original LP. Here is Deano 1 's remark spot on ! With only 3 songs on each side the sound quality should be very good, at least I hope it will be ! Benny, thank you for your kind reply. Deano1, yes, you are absolutely right ! At first they tried to use it for music but due to low quality they soon switched to use it for recordings of talking only. You are also right about sound quality in this way that larger grooves allow more dynamic reproduction. The larger the groove the better the sound. That's why a lot of old 78rpm shellacs sound very good and clear ( except for the hiss, pops and clics of course, LOL) but purely musically speaking these old 'servants' had a great dynamic range. For a song of +/- 2' 30" they could press a lot of large grooves on the available surface area of the platter. Always El. Benny, I have a record player with that speed too. From what I have been told it was for story records and not musical LPs...The reason for only having three songs per side may be because there are some audiophiles that feel less than ten minutes per side produces the best sound. It keeps the needle from skating as the groove gets smaller in circumference which produces a distorted sound. For a short period the 16 2/3 rpm speed existed but the quality of the soundreproduction was not good enough. I still own a couple of Dual recordplayers with 16 2/3 , 33 1/3 , 45 and 78 rpm speed selector but never had or saw a 16 2/3 rpm record. Always El. three songs - perhaps to match this gold record on the cover... I'm not an expert in this matter, but did LPs use any other speed than 33 1/3 rpm? 3 songs per side?? Is this an EP? Not 78rpm, but actually 45rpm!